I hope you all had a wonderful Thanksgiving, with plenty of time spent with your friends and family. 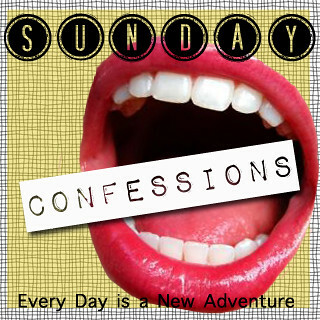 Go ahead and grab a button and link up with your confessions! If you link up, make sure to visit some of the other blogs and make some new friends! 1. I totally forgot about the 15 week belly picture. Oops. Here it is, one day before I'm 16 weeks! How big is baby? See above. Movement? I think I felt a flutter on Thursday when I was laying in bed, but I'm not sure. I've never felt anything like it before, though... so I'm just going to pretend that's what it was. What I miss? Having energy... and the ability to do more "extreme" activities. What I am looking forward to? Feeling baby kick and knowing what it is! Best moment of the week? If that little flutter was a kick, then that was the best moment by far. 2. I decided to take Friday off, and I'm so glad I did! I didn't go Black Friday shopping. 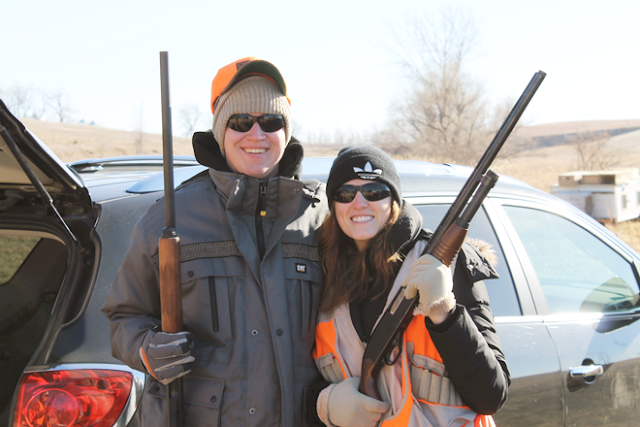 Instead, I spent time with Mike's family and we all went pheasant hunting. We didn't kill for sport - we ate the pheasant for dinner! 3. We are getting the nursery put together! We have the trim all painted and bought the paint for the walls this past week - I'm super excited for it to be done. I'll be sure to share before and after pictures once it's done. 4. I haven't read the book for book club yet... and the link up is on Tuesday! EEK! If you're participating, the book is Gone Girl. 5. I painted my nails for the first time in months yesterday. 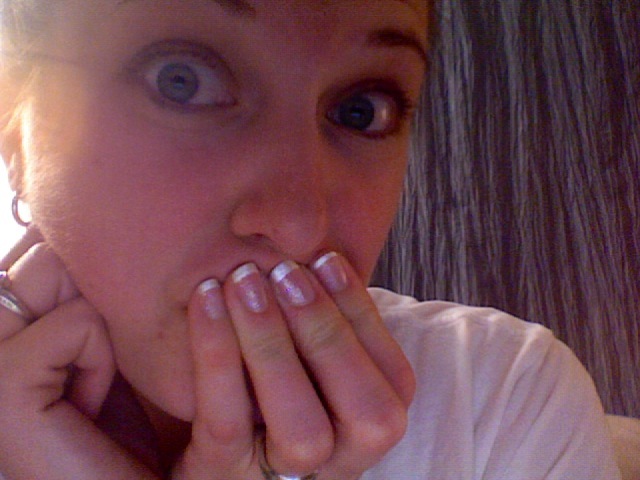 They don't even look that bad - I did French tips with glitter! So what do you have to confess? Link up below!! I love your gun picture. You look so cute with your teeny tiny belly! Can't wait to see pictures of the nursery! I love your pregnancy updates!!! also i just sent out the email about the link up / google hang out. i figured we could say the link-up starts on tuesday and then keep it open for a week so you dont HAVE to do it tuesday! haha. hope you had a relaxing thanksgiving! Look at you and your baby bump!!! What do I confess??? Hmmm... That I'm so jealous!!! LOL. 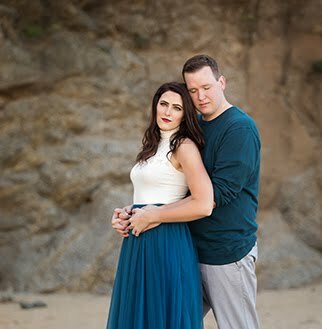 I hope my husband and I can get pregnant soon! Loving the baby bump! You're too cute! You did a great job on those nails! Come do mine? I haven't finished the book for book club, either. But I have many hours in a car tomorrow, so hopefully I'll get it knocked out. I swear everyone can paint their nails but me! Yours look fabulous! I confess that reading your prego updates makes me jealous. I know, I'm ridiculous, but its true. 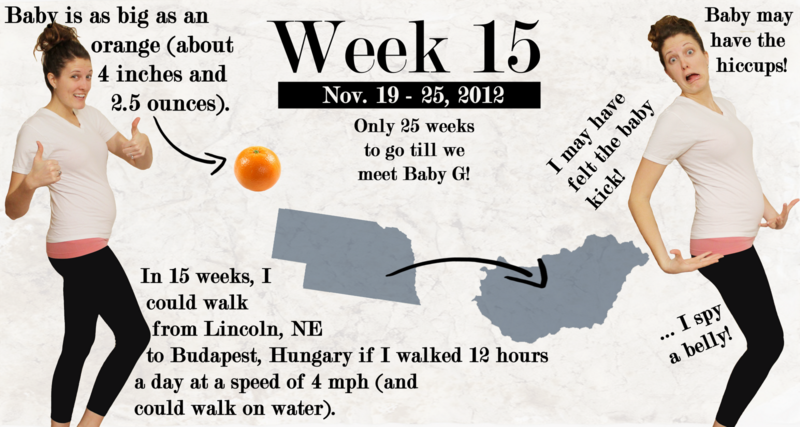 Your pictures are so great - I love the face you're making in your "15 week update". That's super exciting if you felt a kick! I can imagine it'd feel very very weird..
And you've reminded me - I've been meaning to paint my nails. Oh, I am jealous. We wanted to go bird hunting so bad this year! Hopefully next year! 1) I love that you hunt. It's splendiferous. 2) I just wrote my review for Gone Girl. You reminded me with your confession! This may sound really strange but I'm weirdly jealous of your pregnancy. Your belly is just the cutest! haha the most important detail: did you bag yourself a pheasant? !